Want to be notified of new releases in adminfaces/admin-showcase? Showcase is available on Openshift here. The demo runs on the Openshift starter which is a platform used just for testing and not for production. So it’s likely the showcase may be slow or even down. There are several ways to run Admin Showcase on your machine. Just clone this repository and use one of the alternatives described below. 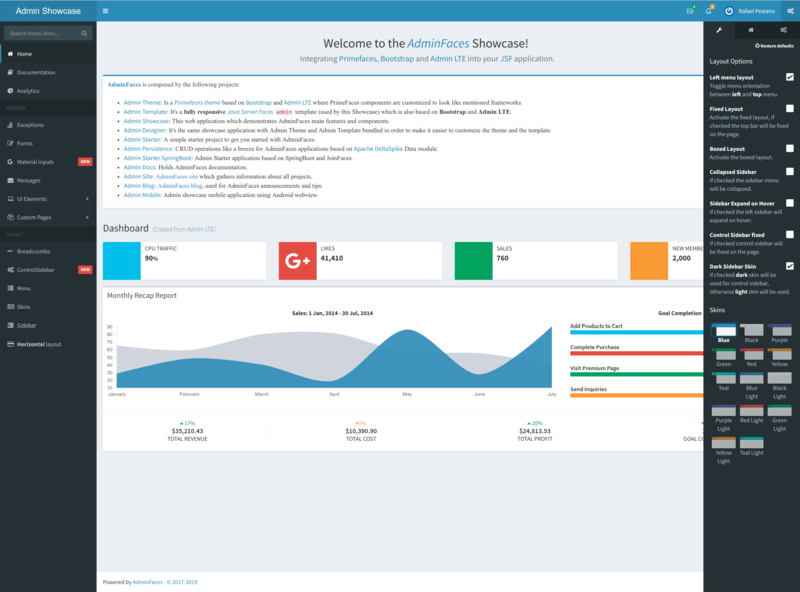 Admin Showcase is compatible with most JavaEE 6 and Java EE 8 application servers. Just build the application with maven using mvn clean package -DskipTests and deploy the resulting showcase.war into a JavaEE 6 or greater server. To run on JavaEE 8 application servers such as Wildfly 16 you’ĺl need to upgrade OmniFaces to version 3.x. use build.and-run.sh to easily run the application via docker. See the chrome driver version the tests are using here and update your chrome browser according to this page. (pay attention to the supports chrome label).